If you had to name a statue, any statue, odds are good you'd mention the Statue of Liberty. And she's in mid-stride, moving forward. 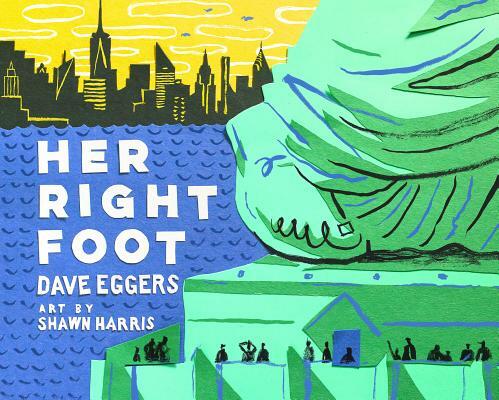 In this fascinating and fun take on nonfiction for kids, Dave Eggers and Shawn Harris investigate a seemingly small trait of America's most emblematic statue. What they find is about more than history, more than art. What they find in the Statue of Liberty's right foot is the powerful message of acceptance that is essential of an entire country's creation. Dave Eggers is the author of many books, including This Bridge Will Not Be Gray, The Circle, and A Hologram for the King. He is the cofounder of: Voice of Witness, an oral-history series focused on human-rights crises; 826 National, a network of writing and tutoring centers; and ScholarMatch, which connects donors and under-resourced students to make college possible. Juvenile Nonfiction / History / Symbols, Monuments, National Parks, etc.